Since it was already well past midnight when I finished yesterday’s blog post, this morning came way too early because we had to get up at 08:00 to be able to leave our nice cabin an hour later. To our slight surprise it was raining, so when we reached the start of the Hardanger National Tourist Route at the first waterfall of the day (the Låtefoss), water was pretty much coming from everywhere. From here we did a large part of the day’s drive on this Hardanger route, heading first North along the Western edge of the Hardangervidda National Park, then West on the North coast of the Hardangerfjord towards Bergen. The drive was very scenic, and the winding road often narrowed to one lane. 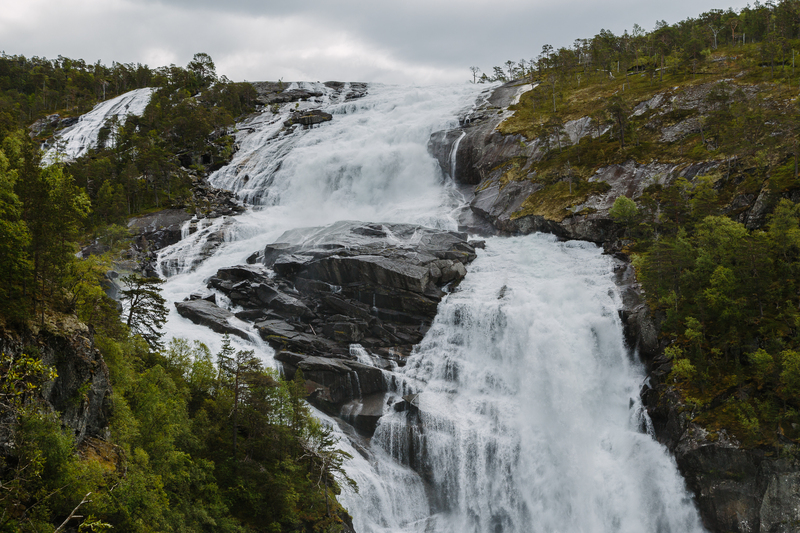 Along the way we crossed two suspension bridges (the larger Hardanger Bridge, and the cuter Fyksesund Bridge), lost counts of tunnels – except for the two that contained roundabouts along them -, and encountered numerous waterfalls. Around halfway between Odda and Kinsarvik it stopped raining, so we could go and do a smaller hike up into the Husedalen valley. The original plan was a four hour hike passing four waterfalls, but as we lost some time due to road works earlier, we had to ditch the last one to compensate (details on Strava). 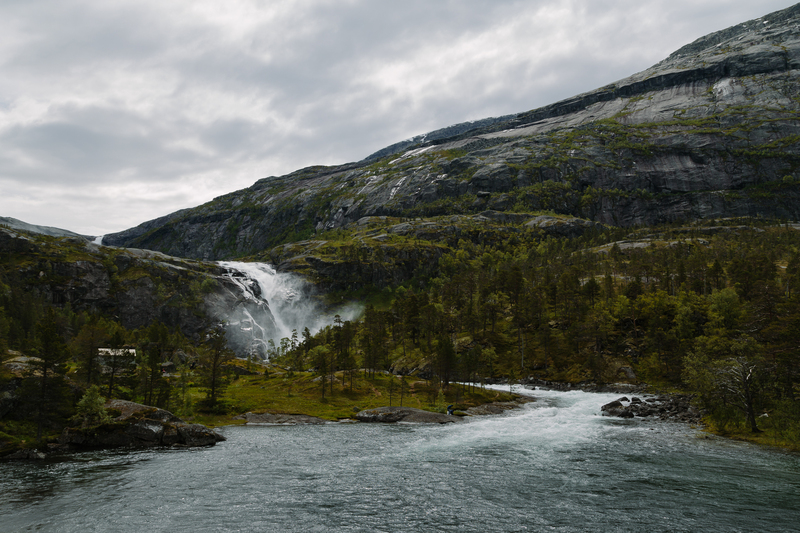 The waterfalls (Tveitafossen, Nyastølfossen, and Nykkjesøyfossen) were beautiful, but I also liked the paths connecting them, climbing through the forest, crossing huge, tilted, flat stone faces here and there. After the hike we still stopped at two other waterfalls along the road: at the Skjervsfossen (where we did not have much time to look around), and at the Steinsdalsfossen (where we could walk behind the water curtain, which was definitely very cool). Odometer reading at the end of the day: 1838 km (of which 263 km was today). 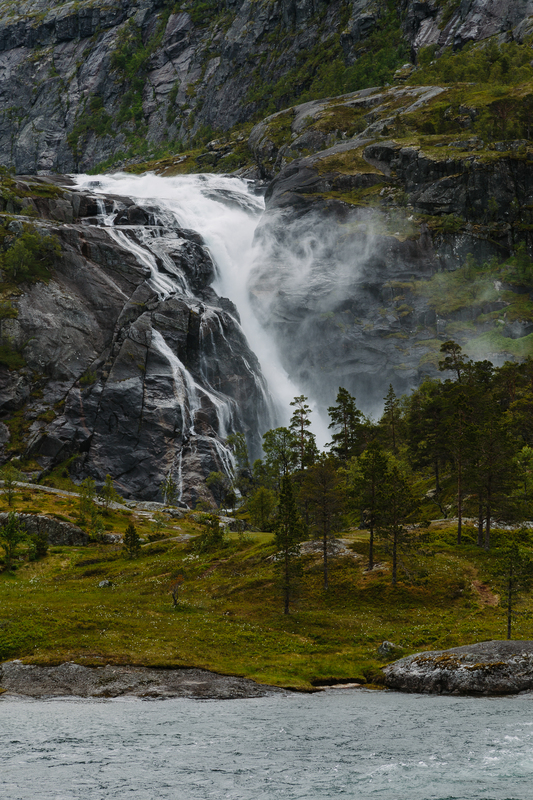 This entry was posted in Uncategorized and tagged hardangervidda, holidays, road trip, rts2017, scandinavia, waterfall on June 29, 2017 by Péter I. Pápics.